Will you indulge me for a bit? I've been torn as to how to do this. 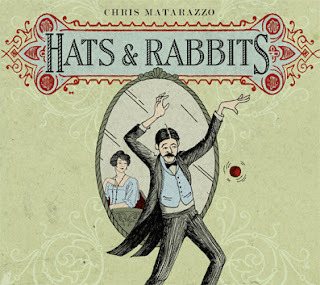 I have mentioned before that I have been working on a CD of original songs, also called Hats & Rabbits. (Actually, this site was named after the CD which was already in progress when I started blogging.) The album took me almost three years to make. 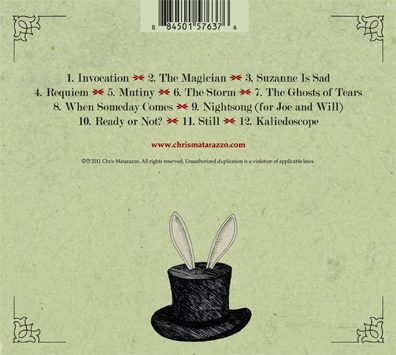 The CD is in the mastering stage and will be available next month, online -- or from me, personally, if you prefer. Instructions to come . . . I find myself in this place of wanting you to know about it but not wanting to turn my blog into a sales pitch forum. But the fact is, I made this CD not in hopes of becoming rich or famous (fat chance), but of sharing my ideas and emotions with those around me. My first thought was of sharing with friends -- of showing them that I am who they have, in their kindness, believed that I am: a capable musician and composer. But, ever since starting this blog, my goals have broadened a little. I have gathered a consistent, insightful audience of readers and on-line friends from around the world. So, I want you all to know about this so that I can share my thoughts and ideas on the CD with you, as well. It will be available -- for a modest sum -- soon. Any money I make from the CD will be used for one thing only: to make the next one. But enough of that. I write music and prose and poetry with the same motivation: communicating ideas and emotions. Music is better than prose for this and, I hope, if you are kind enough to listen, you will find my work on the CD compelling -- even moving. Music has always been my first love and it is, I believe, what I am best at -- however I may or may not stack up to others -- and I hope to share my music with each of you. If you get a chance, please check out my new website and you can browse around and learn a little about the CD and about my musical philosophies, background and ideas. You can also read about the songs -- the ideas behind them -- and even, if you are interesed in this sort of thing, about the writing and recording process. While you are there you can check out the lyrics. (You will probably see some familiar themes if you re a regular reader of this blog.) The website still needs work, but it can give you an idea what I am up to musically. Chris, I absolutely want to purchase a copy. Please let me know when I can purchase. Same goes for me. Can you remind us the day it becomes available? Thanks, guys -- I won't keep it a secret, for sure! Production says Aug 8th for the CDs to be finished so I imagine some time soon after that I can point you all to the right places . . . I really appreciate it. I'm thrilled to hear more about your music, Chris! Congratulations -- this is a big deal. Love the album artwork as well -- very nice! Thanks! And thanks for the compliment on the artwork, too. My sister is an illustrator, by training, and she does CD covers as her day-gig. She and I batted ideas back and forth for this. We went with hand-drawn art. I'm really happy with it. It's good to have talent somewhere in the family! And have I lost track? Are congratulations in order for you, too? I know the wedding was coming up . . .